I had a realization last night, at an out of this world Buckethead show. I realized that the 360 degrees of the zodiac are like a map of wavelengths, just like the knob on the old radio dial. Tune into 26* Sagittarius today and you'll find my Sun! This is why we always draw those close to us that have similar degrees in a sign. My Venus is located at 10* Aquarius and my husband has Mars at 20* Aquarius. This isn't even a super tight conjunction, but when I'm in the flow of my Venus and he is in the flow of his Mars, oh hey, who's on the road right next to me? My husband on his 20* Aquarius road that runs parallel to mine! Last night, Buckethead went jumping off cloudscapes full of lightning and we jumped right with him because he was on a road we know well. His Uranian Libra road is one of our regular trails! When planets aspect each other in a square, their road will cross at some point and the energy will run right up against the other. When planets trine or sextile one another, the wavelengths naturally sing in harmony together. This is a guess of Buckethead's birth time as there isn't one in public record. And it's hard to guess since I can't see his face! He is incredibly shy which is why he wears the bucket and mask. He is so much fire and creativity. His Moon is in Aries, The Trailblazer, and Venus as well, The Love Warrior. And his Mars in Sagittarius is the wild Mustang. Elementally, Buckethead is totally a hot desert, and his music often sounds like that too. But here and there he goes cloud jumping. High in the sky he builds Uranian, Libra lightening storms. And he can be so romantic! 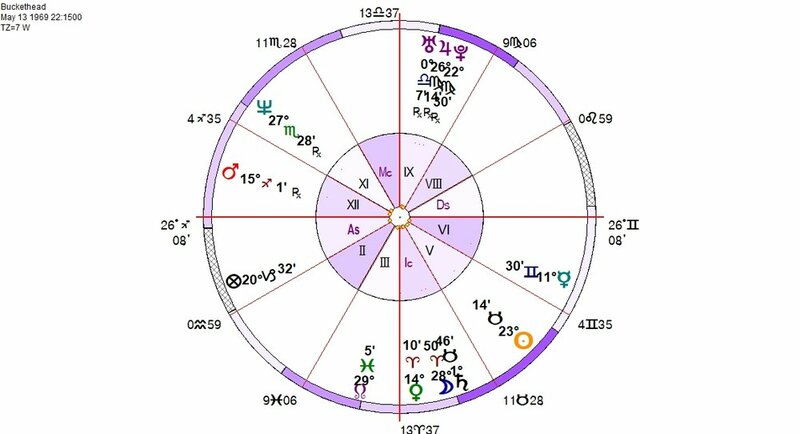 What we're not seeing in the chart below is his Chiron and Venus Star Point at early Aries that really light up and energize his wild Uranus.